I love watching culinary competitions. They are both exciting and nerve-wrecking for me at the same time. 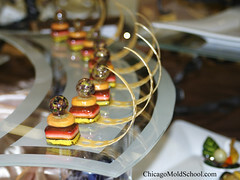 Especially the sugar and chocolate ones where the competitors/chefs have to move their pieces. Maybe one day I’ll compete in one. Meanwhile, here is a gorgeous piece from a photo of a dish at the IKA Culinary Olympics in 2009. I’ve been watching a lot of shows on the food network lately. I saw one candy competition where they had to do a tropical twist to it… and it was just amazing.